"Of the two-thirds necessary for impeachment, the Senate was one vote shy"
The Chief Justice announced, "Two-thirds not having pronounced guilty, the President is, therefore, acquitted of this article." President Andrew Johnson was impeached, but not removed from office. He was the first president to be impeached by the House of Representatives and tried by the Senate. Many Republican Senators put their political careers on the line by voting to acquit. 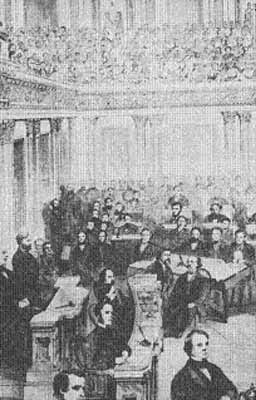 First Lady Mary Todd Lincoln probably sold the text of the "State of the Union" address to the New York Times. She also kept 'ghost' employees on the White House payroll to pay for her extravagances in remodeling. Still, Lincoln was a good man and a good leader, grieved at the state of America. Sam Waterston depicts a man heavily laden with the burdens of a country, constituency, and family that could be enough to break a lesser person's resolve. Mary Tyler Moore's performance as Mary Todd Lincoln was also good. No one will ever know whether it was mental illness, addiction to morphine, or some other cause that drove her to 'headaches' and spendthrift behavior. Tyler Moore's presentation was of Todd-Lincoln was troubled---and human. If you only purchase one DVD about theLincolns, purchase this one.